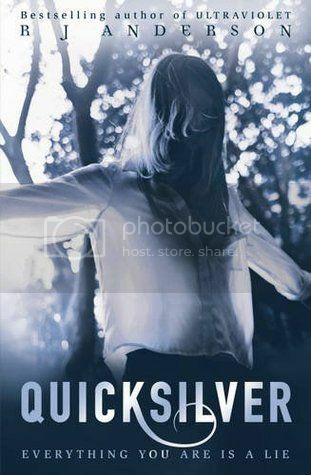 Quicksilver by R. J. Anderson - WARNING! I cannot review this book without spoiling the first in the series. Read no further if you're planning on reading this series and don't want it spoilt for you. Also, I cannot discuss the LGBTQ themes within this story without spoiling it, so, again, do not read any further if you don't want this book spoilt for you. After reading Ultraviolet - despite the fact that I read it so I could read Quicksilver for LGBTQ YA Month - I knew I had to read it's sequel! Ultraviolet was just so utterly gripping, and Quicksilver is exactly the same! After the events of Ultraviolet, Tori has moved from her home in Subury. New house, new identities, new start. Tori, now Niki, is escaping her past; while she was missing, the police tried to look for her by using hair from her hair brush and took samples of the blood from Alison's ring from when she hit her. The DNA tested showed anomolies, and Constable Deckard wants answers. But with the sudden return of Sebastian Faraday, it seems that Tori might not be as safe from the space station and experimentation she escaped from as she expected. With the help of flashbacks, Quicksilver's beginning overlaps Ultraviolet's end. We find out exactly what Tori experienced after returning back to earth, and the hounding she starts experiencing; calls from a genetics lab, and Constable Deckard on her case. To keep her safe, there is no other option than for the family to move and change their identities. But Deckard isn't put off so easily, and it soon becomes apparent that he's on her tail. Meanwhile, the relay that has been offline since her return is suddenly online, and soon Sebastian materialises with bad news; the wormhole hasn't shut down, and Mathis is after her. The only way to make herself safe is to put her engineering skills to use. Unfortunately, I can't talk much more about the plot without spoiling the story, but Quicksilver is just as exciting as the first in the series! And now on to the LGBTQ themes of the book. Tori is asexual. She has no sexual desire for anyone. Quicksilver isn't about Tori's asexuality, it's about the danger she's in, as an alien, from humans and fellow aliens. Her asexuality is just a part of who she is. And it comes up because she makes a good friend, Milo, who gets caught up in all that's going on, and he likes her. It comes to the point where, to be fair on him, because she respects him so much and wants his friendship, she has to tell him about this secret she has, that she's only ever told one other person. What Anderson does well is to inform the reader of what asexuality actually is through Tori sharing her secret. 'And now [Sebastian] was kissing Alison, and she was kissing him back. Not a gentle let-me-comfort-you kiss, either. It was the kind of kiss that looked like it was going to end up horizontal, and Sebastian didn't have any reservations about going there. Well, what does asexuality mean? Is it just a sexual thing, or are asexuals not attracted to anyone whatsoever? Do they live completely single lives? Anderson answers that too; guess it's up to the individual. "'So you're never going out with anyone again?' Milo asked. As I said, this isn't a book about asexuality, so it isn't a font of knowledge on all things asexual, but it's a great starting point, to understand and learn. Unfortunately, I believe there aren't that many other YA novels with asexual characters, just one other. Not much more than this is discussed that I can talk about without spoiling anything. It's just not majorly important to the plot of this story, it's just a part of who Tori is. Overall, Quicksilver is a fantastic book! I do hope there is at least a third book in the series, because it's just so good, and I want more! I'll definitely be checking out more on Anderson's books in future!